Avid has announced new versions of its flagship video editing systems- Media Composer version 6, NewsCutter version 10 and Symphony version 6. All three are rebuilt from the core on an entirely new open, 64-bit architecture.With these versions, Avid is also introducing a new User Interface designed to speed workflows while simultaneously preserving the same functionality. In addition, these systems include support for third-party hardware, AVCHD and Red Epic support with Avid Media Access (AMA), an Avid DNxHD 444 codec, and support for Avid Artist Color. Users can leverage existing hardware investments and add Avid editing systems into current workflow configurations thanks to the new Avid Open I/O, which enables support for video and audio cards from AJA Video Systems, Blackmagic Design, Bluefish444, Matrox and MOTU. Avid’s high-performance hardware video accelerator, Avid Nitris DX is now available as a standalone hardware purchase at a new, reduced price. Nitris DX is available with one or two Avid DNxHD or AVC-Intra chips and supports full resolution and full frame stereoscopic workflows. Users of Symphony software will experience greater flexibility and choice for on-set and mobile editorial and colour work, or meet increased facility capacity—now available as a software-only solution, at a lower cost, according to Avid. AMA has been expanded to offer native support for AVCHD and RED Epic as well as the ability to encode Apple ProRes (Mac OS-based systems only). There is also enhanced Pro Tools integration and 5.1/7.1 surround and extensive metadata management, which allows the transfer of more session data from Media Composer to Pro Tools. Additional metadata is available in the AAF interchange format. Extensive 5.1/7.1 surround support is also fully compatible with Pro Tools through the improved AAF capabilities. New 3D stereoscopic workflows will offer full resolution, real-time editing, mixed eye workflows as well as a deep toolset, with title and conversion control. Editors can also easily export metadata into Avid or other third-party finishing systems for grading and high-end effects. It’s also possible to preserve full colour information from HD RGB 4:4:4 sources without compromising system performance or storage through the new Avid DNxHD 444, a high-quality HD codec. Avid DNxHD 444 can help significantly enhance real-time HD production productivity with the highest color detail possible, is suitable for the most demanding productions, and is also an ideal archiving format. 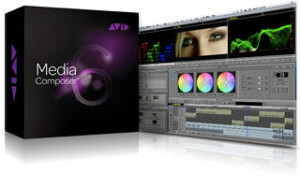 There is also support for the Avid Artist Color control surface within Avid editing systems. A new Avid Marketplace, which offers in-system access to stock footage from Thought Equity Motion, enables customers to browse available video and audio plugins along with other products in the Avid Store to complete a suite. Furthermore a new Customer Assist Tool offers direct, in-app access to guides, help, and configuration information. Concurrent with the launch of today’s announcement, Avid is introducing the Avid Vantage Program, an annual membership program for Media Composer and Symphony customers. It provides subscribers with unlimited online technical support, plus deeply discounted expert phone support when they need it. They also gain access to a collection of NewBlueFX effects (for Media Composer or Symphony subscribers) or audio plug-ins (for Pro Tools subscribers). And, for a limited time, they’ll receive a high-value Avid Store coupon that can be applied to new software purchases or upgrades. Pricing for Media Composer 6.0 starts at $2499. Upgrade pricing starts at $299. NewsCutter 10 starts at $2499. Upgrade pricing starts at $499. Pricing for Symphony 6.0 starts at $5,999. Upgrade pricing starts at $499 and Nitris DX starts at $5,499. Pricing for Media Composer Academic version 6.0 starts at $295 for educational institutions and students. Pricing for Media Composer Academic version 6.0 starts at £209 for educational institutions and students. Final Cut Pro (excluding Final Cut Pro X) users can purchase Media Composer with free online training to help them move from Final Cut Pro to Media Composer, for £1099. © 2011 – 2016, Michael Burns. All rights reserved.